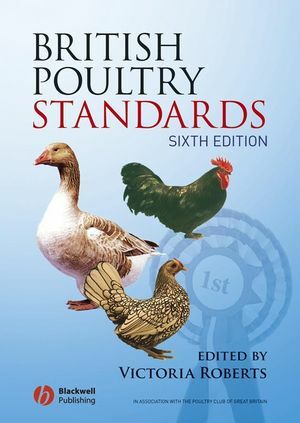 British Poultry Standards 6th edition is the official reference to all the recognised Poultry Standards in Great Britain. It contains complete specifications together with judging points for all standardised breeds and varieties, as compiled by the specialist Breed Clubs and recognised by the Poultry Club of Great Britain. Breeding and exhibiting poultry is a long-held tradition as well as a popular and rewarding hobby. The work of the Breed Clubs and the many dedicated breeders in preserving the pure breeds is vital in maintaining our breeds of poultry not only for the cultural heritage of future generations but also as a gene bank for the commercial world. Under the guardianship of the Poultry Club of Great Britain, this book details the authorised standards of excellence for each breed. • New and improved colour images for many breeds, now with almost 300 colour photographs. • The inclusion of silhouettes to show the perfect shape for each breed. • An additional 14 breeds are covered. Victoria Roberts is a qualified veterinary surgeon and is a well known member of the Council of the Poultry Club of Great Britain. Chief points of the fowl. Barbu du Grubbe (Rumpless d'Anvers). Almost 300 colour photographs of birds of excellence, with many new and improved for the 6th edition. Colour illustrations of feather marking and colouration. Provides complete specifications and judging points for all standardised breeds and varieties of poultry. Published on behalf of the Poultry Club of Great Britain.